Love is a beautiful thing and being in love is just as beautiful as love itself. A newlywed who is head over heels in love with her man has shared the story of how their love story started after they both graduated from the university. The new Mrs Oludiran who was obviously excited by her union with husband Fola Oludiran shared the story of how their life together started. In a post shared on Instagram, the blushing wife identified as Doyin Fola-Oludiran shared the story of how she met the man of her dreams at a graduate trainee school she attended to get employed at a bank. She revealed that they met in 2012 and for a longtime they were just colleagues until a trip to Ibadan brought them closer together in 2014. 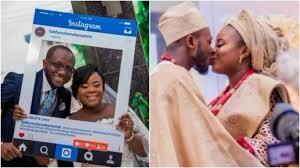 The lady further revealed that her husband asked her to be in a relationship with him in 2015 and he proposed to her in October, 2016. Read story below: "I met Fola (@flo_diran), at First Bank training school, in 2012 while we were both Graduate Trainees; but we never said more than “Hi” and very few words. After about a year in the department I was posted to, I got bored and felt the need to move before I got transferred to the branch or department I wouldn’t want. Fola stepped up to help by asking a few HODs, but it never worked. on NAIJ.com News App Sometime in 2014, at the later part of the year, he took about a year out of work, but we talked almost every day. He was in Ibadan during the period, and fortunately, I and other colleagues including the famous Ayo Odole who happen to be his friends went for event in Ibadan. We stopped by his house to visit and charge our phones *covers face*. I got to meet his mum on the said day, and one of our friends jokingly told his mum I was the one collecting all his money in Lagos. Guess his mum’s reaction; she said she didn’t mind him spending his money on me as I was a ‘full’ package. She asked that I stand and do a 360 turn in front of her. We left Ibadan and life continued. Fola liked me all these while, but I saw him as a friend and colleague because we got talking while we were both in supposed ‘serious’ relationships. When he came back to Lagos sometime in June/July 2015, we continued being friends until he ‘stylishly’ asked me out over a chat in September/October 2016. I accepted and in October 2016, he asked if I would like to spend the rest of my life with him. I told him I wouldn’t have stayed with him for over a year if I hadn’t decided to do that — it was unknown to me that he already had a ring in his pocket. The moment I answered in the affirmative, I got a RING! And the rest, as they say, is history."